This post is in collaboration with Balance Your Plate and Stouffer’s. As part of the collaboration, I received product and incentives in exchange for participating in the program. As busy parents it’s not always easy to give your family a well-balanced meal every day. With working, all the after-school activities, homework, and especially during the holidays… it can get really crazy. Most days I’m so exhausted, both mentally and physically, that I can’t even come up with ideas for dinner, much less have the time to implement them. I’m not Super Mom or Susie Homemaker. I’m just an every day mom doing the best for her family. I know I’m not alone. Every mom I talk to has the same story. I am thankful for frozen meals like the Stouffer’s Lasagna with Meat & Sauce for keeping me sane. We can have a lasagna made with premium ingredients and I can add a side or two for a well balanced meal. I love being able to make meals that we can eat at home together at the dinner table. Dinner time is special and a time where we can connect and talk about our day. It makes me feel good knowing we can have quality family mealtime along with Stouffer’s Family Size Lasagna with Meat & Sauce and a healthy side or two… a great way to balance your plate. The frozen meals today aren’t like the frozen TV dinners of my mom’s day, thank goodness. For example, Stouffer’s meals are made with fewer, wholesome ingredients so you can feel good about your family eating them. The lasagna with meat & sauce has 16 grams of protein with freshly made pasta layered between a rich meat sauce and then topped off with real mozzarella cheese. I really love being able to have delicious well-balanced meals during the holiday season. Everyone is extra busy and it’s too easy to snack on junk food or indulge in a lot of sweets and treats this time of year. Which makes it even more important to balance your plate and provide your family with the nutrition they need. So being able to have wholesome meals on the table means a lot to me. When I learned that Americans were only eating MyPlate recommendations of fruits, vegetables, proteins, dairy and grains, 7 out of 365 days, I was… flabbergasted. We really are falling short. Stouffer’s recently launched the “Balance Your Plate” initiative that is helping families like mine create delicious and nutritious meals using both frozen and fresh foods. A way for moms, and dads, to provide balance your plate meals that not only taste good, but are quicker and easier, too. 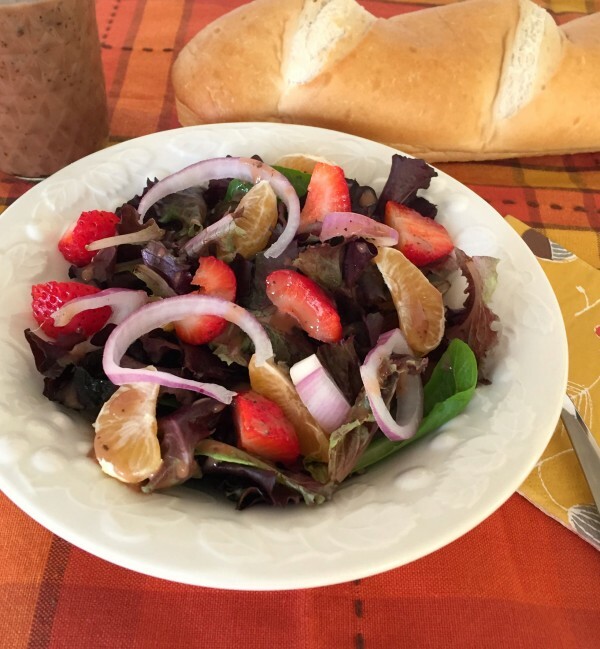 Yesterday I made tomato bruschetta and a strawberry salad (made with spring mix, fresh strawberries, mandarin oranges, and red onion) with a homemade vinaigrette dressing while the lasagna was in the oven — both easy to make and complemented the Stouffer’s Lasagna with Meat & Sauce perfectly. The combination of vegetables and fruit in the salad and tomato bruschetta, along with the bread gave us a balanced plate. Everything was delicious and my family thought the lasagna tasted homemade. 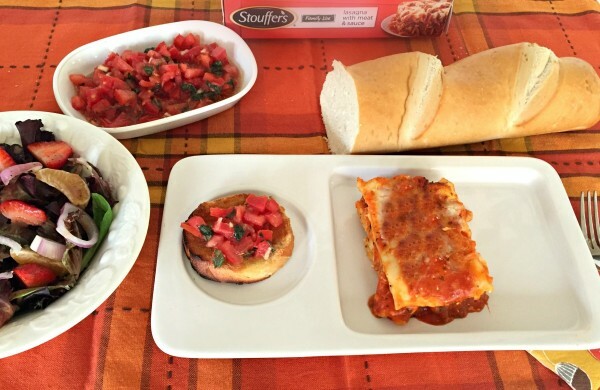 Here’s my tomato bruschetta recipe if you’d like to make it to go with your Stouffer’s Lasagna with Meat & Sauce…. Combine all ingredients and mix well to incorporate all ingredients. Slice bread and toast on broil in the oven for approximately 2-3 minutes or in a toaster oven till brown. Watch closely so bread doesn’t burn. Top with the tomatoes and basil mixture and drizzle a little olive oil just before serving. 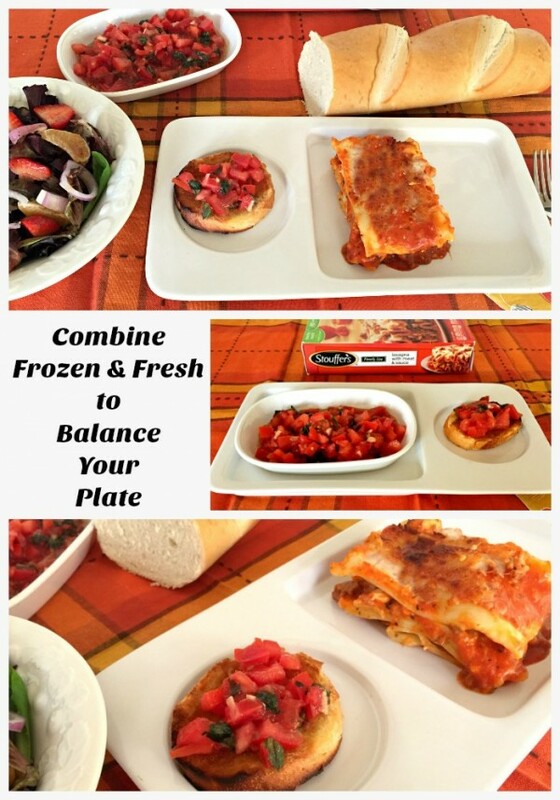 Check out Stouffer’s Balance Your Plate for more tips and recipes, as well as following them on Facebook, Pinterest, and Twitter for easy ways to combine frozen and fresh foods for your family’s mealtimes.